May 30, 2013 | Two nationally prominent educators who are finalists for the presidency of Medgar Evers College will meet with key stakeholders on campus next week. John Garland is the first president-in-residence at the Thurgood Marshall College Fund and served as the longtime president of Central State University in Wilberforce, Ohio, leading the historically black university through two cycles of reaccreditation. Fayneese S. Miller is dean of the University of Vermont’s College of Education and Social Services and a professor of human development, educational leadership and social policy. A third finalist will be announced next week. The presidency of Medgar Evers College attracted a high-quality pool of more than 50 candidates, which is approximately the same number who applied for the City College presidency two years ago. The University search committee selected 14 candidates for extensive interviews and approved three finalists to visit the campus. Each will visit the campus for a daylong schedule of meetings with executive administration and deans; department chairs; higher education officers; students; and representatives from the College Council, Faculty Senate and Professional Staff Congress. A meet-the-candidate forum and two Community Council panels will follow those meetings. The search committee included CUNY Trustees, the presidents of Medgar Evers’ Community Council and the alumni association, elected student government leaders and a president of a CUNY senior college. John Garland, as president of Central State University in Wilberforce, Ohio, led the historically black university through two cycles of reaccreditation, rebuilt its financial and administrative systems, oversaw a 150 percent increase in enrollment, refurbished facilities, built eight new academic and residential buildings, and developed a facilities master plan and academic and administrative strategic plans. He also established new academic programs and created the College of Science and Engineering. As a Marine corporal E-4, Garland received the Purple Heart for wounds received as an infantry squad leader in Vietnam. He was a staff attorney with the Federal Communications Commission. At the Washington Lawyers Committee for Civil Rights Under Law, he recruited and trained more than 100 lawyers to represent veterans who received less than honorable military discharges. He codirected an employment project for the Center for Law and Social Policy, challenging the Nixon administration’s impounding of funds before the U.S. Court of Appeals for the District of Columbia. Before the U.S. Supreme Court, he filed an amicus brief for the National Medical Association (which advocates for physicians and patients of African descent) in an employment discrimination case. Garland started a legal service program for low-income residents of 11 rural counties in North Carolina. He was general counsel of the University of the District of Columbia. At the University of Virginia, he was associate general counsel, executive assistant to the president and then associate vice provost for intellectual property. He now serves as the first president-in-residence at the Thurgood Marshall College Fund, which assists the students, faculty and executive leadership of the 47 public historically black colleges and universities, and was appointed by the secretary of the Navy to the Board of Visitors (which advises the president) of the Marine Corps University in Quantico, Virginia. He received a B.A. from Central State University and a J.D. from the Ohio State University College of Law. 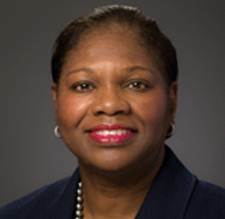 Fayneese S. Miller is dean of the College of Education and Social Services and professor of human development, educational leadership and social policy at the University of Vermont. As dean she is the chief academic, fiscal and administrative officer of the college, which has some 17 bachelor’s, master’s and doctoral programs. She retired an inherited deficit within two years and, during the recession, balanced budgets without freezing or eliminating positions; actively fundraised; and, over seven years, hired the largest number of diverse faculty at UVM. She charged a committee with studying undergraduate education at UVM, resulting in creation of first- and second-year experiences for all students, among other changes. Reorganization led to increased research collaboration, decreased course duplication, better faculty morale, greater student satisfaction and higher graduation rates. Previously, she was associate professor of education and human development at Brown University, a past director of Brown’s Center for the Study of Race and Ethnicity in America, and developer and first chair of its first ethnic studies program. As a social psychologist, she specializes in the psychosocial development of youth, with emphasis on alienation, social identity and cross-racial friendships. With funding from the Eli Lilly Foundation, she conducted research on black males. For the Rhode Island Supreme Court, she studied perceptions of racial/ethnic bias, and for the Rhode Island Family Court she looked at school-based truancy courts. She serves on the U.S. Department of Justice’s National Truancy Prevention Association Board; in collaboration with that agency, she wrote a bench book on truancy for family court judges. She recently completed a book, “Transforming Learning Environments: Strategies for the Next Generation,” and co-authored a forthcoming book on adolescent social behavior with George Liebowitz. Miller earned a B.A. in psychology at Hampton University, an M.S. in experimental psychology and a Ph.D. in experimental social psychology at Texas Christian University, and did postdoctoral work at Yale University and applied social psychology. In recent years, the University has invested more than $300 million in new and newly renovated campus facilities, including a new $235 million, state-of-the-art academic building and a $22 million School of Business and student support services building. Meanwhile, the college has expanded its faculty, particularly in the STEM fields (science, technology, engineering and mathematics), nursing, business social work and library science. The newest hires bring impressive academic and professional credentials, along with research backgrounds in venues as varied as NASA, South Africa and Vietnam, in disciplines as cutting-edge as stem-cells, remote sensing of greenhouse gases and renewable and sustainable energy.